2013 continues to be a successful one for our Affiliates! Three Affiliate museums received support from Smithsonian Community Grant program sponsored by MetLife Foundation. Abbe Museum in Bar Harbor, ME-$4,000: To fund honoraria and travel expenses for participants in the museum’s planned public programs for their hosting ofÂ IndiVisible: African-Native American Lives in the Americas. Programming includes a panel discussion examining different perspectives on the blood quantum vs. lineage debate.Â Â Additionally, funding will support a genealogy workshop; and a lecture featuring the exhibit curator, Gabrielle Tayac (Piscataway). Institute of Texan Cultures, University of Texas at San Antonio in San Antonio, TX-$5,000:To fund honoraria for speakers in the Institute’s planned public program forÂ Native Words, Native Warriors,Â providing audiences with a deeper understanding and appreciation of the American Indian Code Talker story. Additionally, funding will supportÂ craft and educational materials for a family day. Japanese American National Museum in Los Angeles, CA-$5,000:To fund eight live performances that will serve as inspiration and as a backdrop for sharing stories of Asian Pacific Americans who have shaped and been shaped by our nation’s history. Two actors will deliver monologues that will expand upon content inÂ I Want the Wide American Earth: An Asian Pacific American Story. South Dakota State Historical Society Press in Pierre received $2,500 from the South Dakota Humanities Council for research related to the potential creation of a contemporary profile of Yankton emphasizing the cityâ€™s relationship with the Missouri River and investigating the state of farming in the Yankton region. The Lincoln Park Coast Cultural District will receive $240,000 from ArtPlace America, and a three year grant for $712,000 from the Kresge Foundation for general operating and the completion of The FaÃ§ade project. The funding will help Lincoln Park Coast Cultural District transform a historic eight-story Greek Revival faÃ§ade into a 600-person outdoor venue and urban farm. The Kansas Cosmosphere has been awarded a $15,000 grant to develop new educational curriculum to interweave arts and science. The grant money, provided by the Alcoa Foundation, will be used in program development, core curriculum material development and outreach to teachers in Kansas to encourage field trips. The National Endowment for the Humanities has awarded $248,600 to the Ohio Historical Society to continue the digitization of Ohio’s microfilmed newspapers, an undertaking that will include three historic area publications. The Montana Historical Society received a $10,000 donation from Burlington Northern Santa Fe to assist in the acquisition of nearly 32,000 postcards dating from 1898 into the 1970s and covering a wide range of topics â€“ from railroads, mining and agriculture to commerce, Western life and Native American. A collaborative effort, including the Milwaukee County Historical Society, to create TheÂ Encyclopedia of Milwaukee, a coffee-table book and interactive website chronicling the history of the Greater Milwaukee area has received a $250,000 grant from the National Endowment for the Humanities. The grant willÂ supportÂ research and development ofÂ the book and website, which are intended to become a first-stop resource for K-12 teachers, students, the media, historians, scholars, and even families conducting genealogy research. The Museum of Nature and Science in downtown Las Cruces received brand new solar experiment kits from Sunspot Solar to assist children in understanding the technology. The Tsongas Industrial History Center, Lowell National Historical Parkâ€™s educational partnership with the University of Massachusetts Lowellâ€™s Graduate School of Education, has been selected to receive a 2013 â€œTicket to Rideâ€ grant from theÂ National Park FoundationÂ (NPF). The Ticket to Ride program, supported by a $500,000 grant from the Disney Worldwide Conservation Fund, helps students explore the outdoors by providing transportation and program support to national parks around the country. The Michigan Humanities Council (MHC) approved $15,000 in funding to The Michigan State University Museum to create a multimedia program and performance tour commemorating the 75th anniversary of American folklorist Alan Lomax’s historic field collecting trip in Michigan. The Museum of American FinanceÂ announced thatÂ Southport Lane, a New York-based private equity and asset management firm, will be sponsoring free Saturday admissions for the remainder of 2013. The Massachusetts state Senate recently passed a $33.99 billion balanced budget for fiscal 2014, which includes $100,000 for the restoration ofÂ Mayflower II. Honored as a premier tourism attraction at the 2012 Massachusetts Governorâ€™s Conference on Travel and Tourism, Plimoth Plantation andÂ Mayflower IIÂ are considered a major force in the stateâ€™s economy, attracting more than 360,000 visitors to the commonwealth each year. The Peoria Riverfront Museum has been awarded the LEED Gold Certification from the U.S. Green Building Council signifying the building is both environmentally and energy efficient. Snug Harbor Cultural Center and Botanical Garden received a 2013 Neighborhood Achievement Award from NYC Mayor Michael Bloomberg in recognition of the organization’s successful revitalization of its Artist Residency Program and its Heritage Farm Program. Riverside officials selected Sarah Mundy as director of the Riverside Metropolitan Museum and head of the cityâ€™s arts and culture department, a position she has held on an interim basis since late December. Devon Akmon has been appointedÂ Director of the Arab American National Museum. Ellen NoÃ«l Art Museum announced George Jacob has been named the new executive director. The board of directors of the Milwaukee County Historical Society named longtime philanthropy leader Deborah Fugenschuh as the society’s new executive director. Congrats to these Affiliates makingÂ news! Each month we highlight Affiliate-Smithsonian and Affiliate-AffiliateÂ collaborations making headlines.Â If you have a clipping highlighting a collaboration with the Smithsonian or with a fellow Affiliate you’d like to have considered for the Affiliate blog, please contact Elizabeth Bugbee. 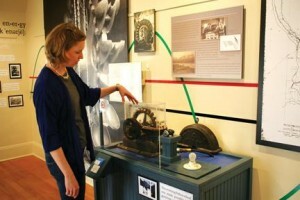 Telluride Historical Museum Executive Director Erica Kinias demonstrates the restored Pelton Wheel, which uses water to generate electricity. The museum was recently named a Smithsonian Affiliate. Photo by Heather Sackett. 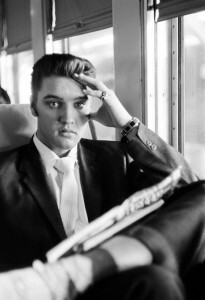 Elvis on the Southern Railroad between Chattanooga and Memphis, Tenn.
July 4, 1956. Â© Alfred Wertheimer. 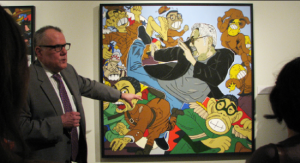 David Ward of the National Portrait Gallery discusses a painting by Roger Shimomura at the Japanese American National Museum. We’re looking for up to 20 Affiliates to receive $10,000 and training in Washington, D.C. to document innovation in your community. Places of Invention (POI) is an exhibition in development, organized by the Lemelson Center for the Study of Invention and Innovation, and scheduled to open at the National Museum of American History in 2015. The Lemelson Center team is looking to Affiliates and their community partners to explore the central idea of the Places of Invention exhibitionâ€”that invention is everywhere and a product of the unique combination of people, resources, and surroundings that come together in a certain place and time. Teams, led by Affiliates, are asked to apply these themes to their own communities and create multiple deliverables, including videos, oral histories, and public programs. One or more short videos synthesizing their findings will be featured on a dynamic, large-scale interactive map, central to the POI exhibition. Join us in this new model of co-creation of exhibition content! The deadline to apply via written proposal is September 1, 2013. For more details and information on how to apply, email or call AnnaÂ Karvellas atÂ (202) 633-4722. Places of Invention has been made possible by a generous grant from the National Science Foundation. Promote your Smithsonian Museum Day Live activities with us! On September 28, 2013, many Smithsonian Affiliates will be opening their doors for FREE as part of Smithsonian Magazine Museum Day Live! Museum Day Live! is an annual event hosted by Smithsonian magazine in which participating museums across the country open their doors for free to anyone presenting a Museum Day Ticket. So far, more than 60 Smithsonian Affiliates are participating and many will even have special Smithsonian programs coinciding with Museum Day Live! Weâ€™d like to help you promote your Museum Day Live! activities by sharing them on The Affiliate blog and our social media platforms as well as share them with our colleagues at smithsonianmag.com. Weâ€™ll be featuring Affiliates on The Affiliate blog throughout August and September and highlighting Smithsonian collections, exhibits, programs and more in Affiliate neighborhoods. Follow these guidelines and email Elizabeth Bugbee (bugbeee@si.edu) to submit blog ideas. There must be a Smithsonian connection. It can be a new program or event or bringing new life to an ongoing loan or exhibit from the Smithsonian at your organization. Please send a brief description of the program, exhibit, loan, etc. Please send a great photo to post on our blog and social media. Let us know who to contact for more information. Septembers with the Smithsonian at The Museum of Arts and Sciences in Daytona Beach, Florida. Hereâ€™s a small selection of whatâ€™s happening in your neighborhood on September 28. And stay tuned for blogs throughout August and September highlighting these events and more! Lydia Mendoza; photo courtesy Courtesy Lydia Mendoza. American Jazz Museum (Kansas City, Missouri): In Spanish the word “sabor” means “flavor” and is often used to describe good music. 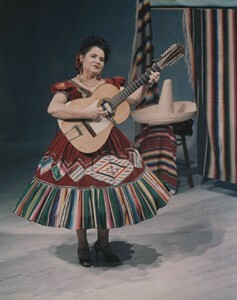 Sample the unique ingredients of Latino Music in the U.S. and indulge in sabor musical dishes across America in the exhibition American Sabor: Latinos in U.S. Popular Music, organized for travel by the Smithsonian Institution Traveling Exhibition Service. On view through October 27, the exhibition focuses on five major centers of Latino popular music production in the years after World War II – New York City, Los Angeles, Miami, San Antonio, and San Francisco. 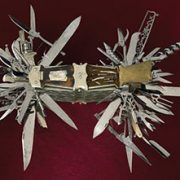 Buffalo Bill Center of the West (Cody, Wyoming): The â€œMother of all Swiss Army knivesâ€ is currently on view thanks to a loan from the National Museum of American History. If you count the miniatures inside, it has 100 â€œblades,â€ and yes, even a functional .22-caliber five-shot pinfire revolver. The one modern convenience it doesnâ€™t seem to have is a bottle opener, but the bottle cap as we know it wasnâ€™t invented until 1892â€¦ The collection (64 objects from the National Firearms Collection) is on long-term loan to the Center. 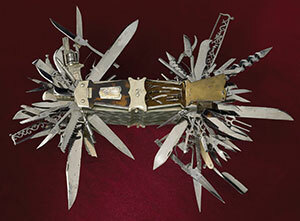 The “Mother of all Swiss Army knives” on view at the Buffalo Bill Center of the West. To see the full list of participating Affiliate organizations, click here. To register your museum for Museum Day Live!, click here. https://affiliations.si.edu/wp-content/uploads/2013/07/knifegun.jpg 221 300 Elizabeth Bugbee https://affiliations.si.edu/wp-content/uploads/2019/03/si_Affiliations_rgb_single-line_color-280w-1.jpg Elizabeth Bugbee2013-07-19 14:20:532017-03-10 17:50:24Promote your Smithsonian Museum Day Live activities with us! Sharing a great article from By Katharine MacKnight at KULR-8 TV in Billings, Montana. In 1876, the Smithsonian’s National Museum of American History established the National Firearms Collection in Washington, DC. It’s the home to nearly 7,000 artifacts. Sixty-four of them are now on display at the Buffalo Bill Center of the West Firearms Exhibit. It’s one of the largest collections of firearms to come out of the Smithsonian. “It’s for people who love firearms and know a lot about them and also for people who don’t know a lot and would like to come in and learn why it’s important to American history,” says Ashley Lynn Hlebinsky, Firearms Curatorial Resident at the Buffalo Bills Center of the West Firearm Exhibit. “Journeying West: Distinctive Firearms from the Smithsonian” is an exhibition at the Buffalo Bill Center of the West. It was a carefully researched and planned out process that took Curator Warren Newman years to bring together. Spend your summer at a Smithsonian Affiliate! Check out these events in your neighborhood in July and August. Kevin Gover, National Museum of the American Indian and Harold Closter, Smithsonian Affiliations, attended the public announcement of the Abbe Museum as a new Smithsonian Affiliate in Bar Harbor, 07.05. Lindsay Bartholomew, science curator at the Miami Science Museum, presented as part ofÂ the Smithsonian Center for Learning and Digital Access online webinar, Do It Yourself Astrophotography:Â Applications for the Classroom and Beyond, along with Mary Dussault, Smithsonian Astrophysical Observatory, in Washington, D.C, 07.10. The B&O Railroad Museum collaborated with the Smithsonian Science Education Center for a Science Education Academy for Teachers workshop, in Baltimore, 07.10. Warren Perry, National Portrait Gallery curator, will guest jury the exhibition Humor Me! at Annmarie Sculpture Garden and Arts Center, in Solomons, 08.07. National Outreach Manager Aaron Glavas will be speaking at the public announcement of the Telluride Historical Museum as a new Smithsonian Affiliate in Telluride, 7.29. 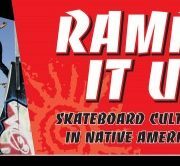 The Idaho Museum of Natural History will host the Smithsonian Institution Traveling Exhibition Service (SITES) exhibit Native Words, Native Warriors in Pocatello, 07.20. 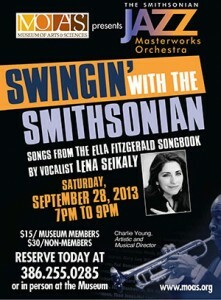 The American Jazz Museum will host SITESâ€™ American Sabor: Latinos in U.S. Popular Music, in Kansas City, 08.01. The USS Constitution Museum will host a teacher workshopÂ featuring a lectureÂ by Sidney Hart, Senior Historian from the National Portrait Gallery, in Boston, 07.26 and 08.09. TenÂ Affiliates are hostingÂ student interns as part ofÂ the Smithsonian Latino Centerâ€™s Young Ambassadors Program, through 08.02â€”Adler Planetarium and Astronomy Museum, Fort Worth Museum of Science and History, Museo de Arte de Puerto Rico, Musical Instrument Museum, California Science Center, Museum of Latin American Art, Chabot Space and Science Center, Miami Science Museum,Â Museum of Flight,Â and the International Museum of Art and Science. FourÂ Affiliates are participating in a Smithsonian EdLab teacher workshop, Connecting Classrooms, throughout July and August â€”the South Dakota State Historical Society in Pierre;Â the International Museum of Art and Science in McAllen, Texas; the Museo de Arte de Puerto Rico in San Juan; andÂ Bisbee Mining and Historical Museum in Arizona. LAST CHANCE! See these exhibitions in your community before they close! 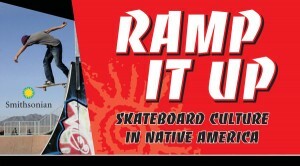 The SITES’ exhibit Ramp It Up: Skateboard Culture in Native America closes at the Mashantucket Pequot Museum & Research Center, in Mashantucket, 07.21. Within the Emperorâ€™s Garden: The Ten Thousand Springs Pavilion exhibit closes at the International Museum of Art and Science, in McAllen, 08.18. SITES’Â exhibit IndiVisible: African-Native American Lives in the Americas closes at the Abbe Museum, in Bar Harbor, 08.04.